Tim and Bronwyn Wiechmann at Bronwyn in Somerville. Transitions: Tim Wiechmann and his wife, Bronwyn, will open a second branch of their lovable Union Square sausage shop (also named Bronwyn) in the coming months. “My love is making sausage and having a party,” Wiechmann says. To this end, he and his wife have closed Self-Portrait in Cambridge’s Huron Village. The short-lived fine dining restaurant replaced his lovable T.W. Food earlier this year. 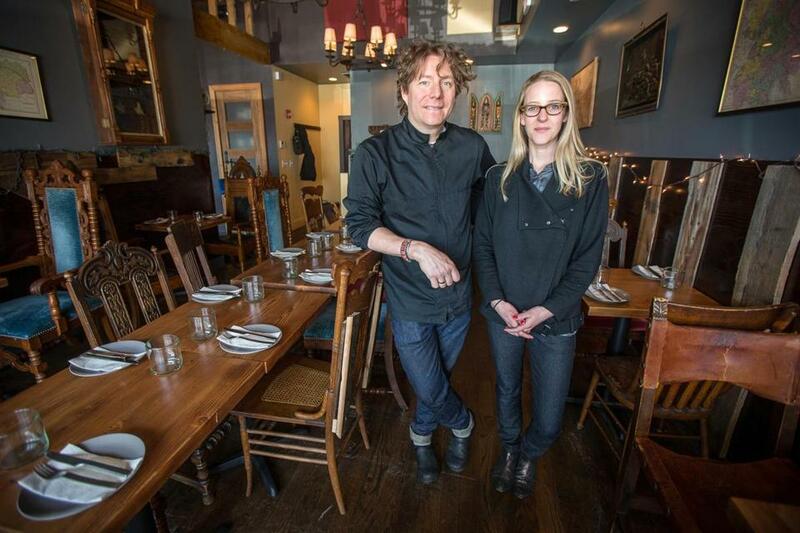 At the time, Wiechmann told the Globe that he wanted to bring an “old-school, chef-driven bistro” to the neighborhood. Not all is lost: Wiechmann is transferring the space to a young, motivated couple — “I can’t say who yet”— who will keep the spirit alive. Stay tuned for a location. Shepard St. at Massachusetts Avenue). She opened the restaurant with Hi-Rise Bread Company’s Rene Becker. “Rene and I have officially dissolved our partnership,” she says, noting that Becker is now the full owner. “Time for me to regroup,” she says. The restaurant endured woes in the spring, when Cambridge health officials ordered it to stop using charcoal and wood for cooking, following neighbor complaints. Coming soon: Somerville retail wonderland Assembly Row gets a taste of the North End when Carmen’s Trattoria & Italian Pub opens in March (521 Assembly Row). It’s an offshoot of Carmen, a longtime neighborhood special occasion restaurant, which closed in 2015 after 17 years. Director of operations and executive chef Jeff Malloy plans an approachable new Carmen’s— not Carmen — for a different demographic, with flatbreads, cheeses, chicken parmesan and meatball sliders, and charcuterie, plus Italian-American staples like veal chops. Which isn’t to say there won’t be upscale touches at the 120-seat retreat. “We’re going to bring back the American version of Italian comfort food with the elegance of Carmen — an oversize veal chop parmesan, classic dishes, but also sushi-grade tuna with celery root puree,” he says. And, also, brunch. It opens in March. Cheers: Drink well and do good with the Upper Glass, a monthly wine curation club that partners with top Boston sommeliers. This month, Alden & Harlow and Waypoint’s Jen Fields chooses four interesting Thanksgiving wines. Each shipment is $80, and Upper Glass delivers within the I-495 boundary. “We’re trying to push people out of their comfort zone to try new wines at a value. These are Wednesday night wines,” says founder David Garlough. Twenty percent of proceeds go to the Greater Boston Food Bank. Order by Nov. 14 at www.theupperglass.com.